Date : Paris, c. 1810. Size : 7.3 x 9.1 inches. / 18.5 x 23.0 cm. 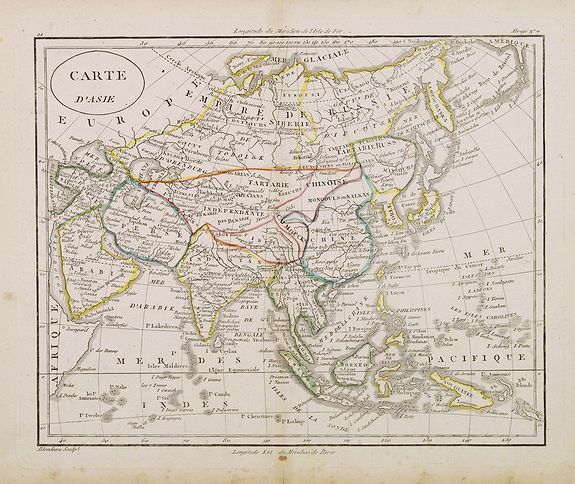 Description :Fine map of Asia, with an interesting representations of Japan, Hokkaido, Sakhalin Island, Kamchatka and Korea. Engraved by Alexandre Blondeau, who also worked for Depot de la Guerre. The map is of further interest for the use of G. de Coree for the sea between Korea and Japan. Map of Asia. The map is based on the Paris Meridian, only in 1884, at the International Meridian Conference in Washington DC, the Greenwich Meridian was accepted. Condition : Paper age-toned mainly in margins.